Today – June 23 – is #OlympicDay, when the International Olympic Committee (IOC) calls on people all over the world to get off the couch and get moving! To motivate people to get active, IOC is offering a chance to win a trip for two to Rio de Janeiro in the #OlympicDay contest. All you have to do is use #OLYMPICDAY to show how you get active. The contest runs till the end of June. One of the ways I get active is by indulging my Strava-doodling obsession. At 18.4 km and just over 45 minutes, my #OlympicDay doodle was comparatively quick. And apart from one short segment at the top of the “O” where I had to ‘connect the dots’ between two dead-end roads, my #OlympicDay route was uninterrupted. As for the GPS scattering happening along 48.437º latitude…the afternoon was windy, but I didn’t think it was THAT windy! 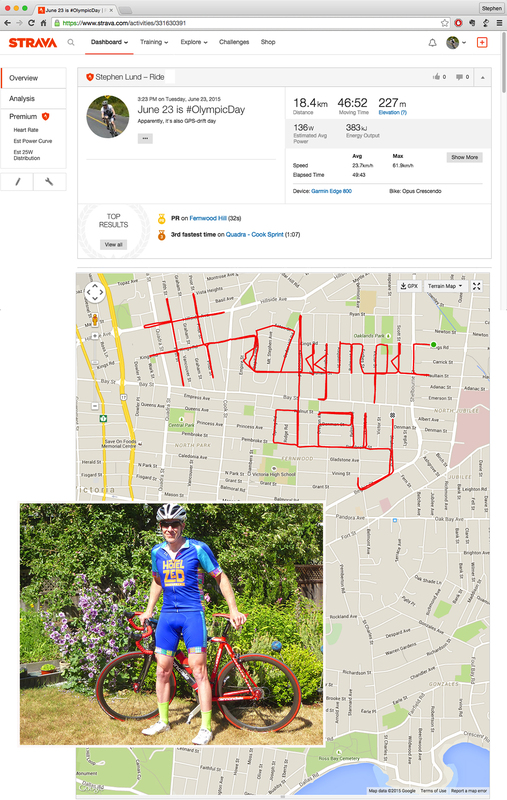 This entry was posted in bike-writing, gps art and tagged #OlympicDay, bicycling, bike-writing, contest, creativity, cycling, garmin, gps, gps art, IOC, Rio de Janeiro, strava, strava art, victoria bc. Bookmark the permalink.